For the meatballs, in a small bowl, soak the bread in milk. Squeeze out the excess milk and add to the meat in a large bowl. Add the remaining ingredients and roll 2 1/2-inch balls and arrange on a parchment-lined baking sheet. Bake to partially cook and lightly brown, 15 minutes. For the sauce, add the olive oil to a large Dutch oven over medium heat; add the butter and melt. Add the onion, garlic and salt, and partially cover. Sweat until very tender, 20 minutes, stirring frequently – lower the heat if the onion browns. Add the wine and reduce by half; add the stock and the tomatoes and break up the tomatoes a bit. Bring to a bubble; reduce the heat and simmer. Add the basil and cheese rind, cook gently 30 minutes to thicken, then add the meatballs and keep at low simmer while you cook the pasta. Bring a large pot of water to a boil for the pasta. Salt the water and cook the pasta to al dente. Add a mug of the starchy cooking water to the sauce before draining the pasta. Toss the pasta with the butter and half of the sauce. Serve in shallow bowls and top with more sauce and meatballs. Pass extra cheese at the table. In Recipes-list.com we have selected the most viewed recipes from category - uncategorized . Enjoy the best recipes specially selected for you! 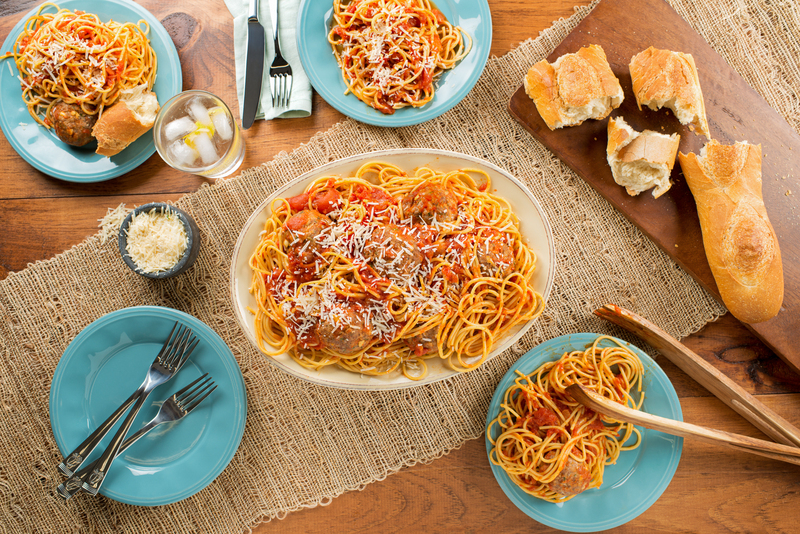 Sunday Spaghetti and Meatballs is the right choice that will satisfy all your claims.